Located between Dead Sea and Red Sea, Petra is a dazzling ancient city known as “rose red city, half as old as time.” Because of its breathtaking grandeur and marvelous ruins, UNESCO declared Petra a World Heritage Site in 1985. This historical and archaeological Jordanian city is one of the new Seven Wonders of the World. Al Khazneh or the Treasury in Petra is a remarkable Middle East beauty and not visiting this must be called a miss of a lifetime. You should stay at least a couple of days in Petra to behold the stunning looks of Al Khazneh and other Petra attractions in different parts of the day. Commonly known as “Norway of Arabia”, the Musandam Peninsula is one of the most beautiful travel destinations in the Middle East. It is renowned for its mountain-hugging roads, small villages and most importantly spectacular khors (rocky inlets). Just a few hours from the buzzing city of Dubai, the serene fishing villages of the Musandam Peninsula look simply stunning and always waiting to surprise its visitors with its beauties. 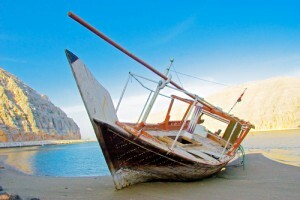 A dhow trip around the khors of the Musandam, surely warrant a holiday in Oman. Historically important to Muslims, Christians and Jews alike, Mount Sinai is believed to be the place where God delivered his Ten Commandments to Moses. Climbing to the summit of the Mount Sinai is one of the sure things to do in Egypt. The summit offers spectacular views of nearby plummeting valleys and of rough mountain chains rolling off into the distance and it’s generally possible to observe the even-higher peak of Gebel Katarina in the distance. On a sparkling night, surrounded by the outrageous shapes of mountains, travelers realize why Mount Sinai keeps on casting a spell over all who visit. The spectacular Wadi Rum of Jordan is known as the Valley of the Moon. It is a massive desert valley situated between beautiful city of Petra and Red Sea. The rock formations of Wadi Rum resemble the desert valley’s found in Nevada and Arizona. It is a renowned jeep safari destination for its isolated, rocky desert terrain. A luxury trip to Jordan is also an option, as it boasts some of the scenery and hospitality in the world. 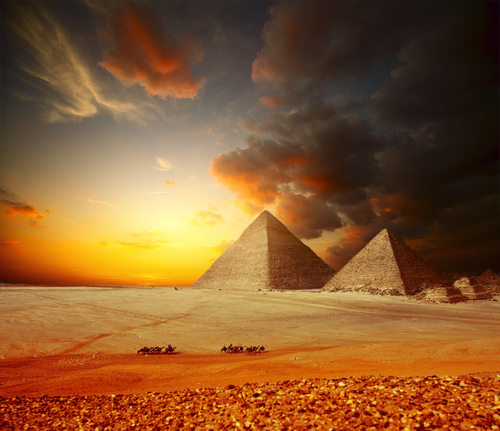 The Egyptian Pyramids are perhaps the most symbolic attractions of Egyptian civilization. Considering the fact that the pyramids were built with skill and precision without using the help of today’s technology, the architectural beauty of the pyramids is sure to surprise the most knowledgeable of architects. It is surely a real architectural masterpiece and deserves to be mentioned as one of the most stunning sties to see in Middle East. Tourists are allowed to venture inside of Khufu’s-Pyramid; the biggest of all Egyptian pyramids, to have a good understanding of the purpose it was built.